In recent years, the attention that is automatically given to a newly released online casino site has diminished at an alarming rate. With a huge number of established sites and an abundance of new names being added to the market on a regular basis, online casino players are spoilt for choice already, and a new site often feels like nothing more than a distraction in the hunt for the perfect place to play. However, there have been a few sites over recent years that have made an impact upon release simply by offering exciting gaming options and a great look. 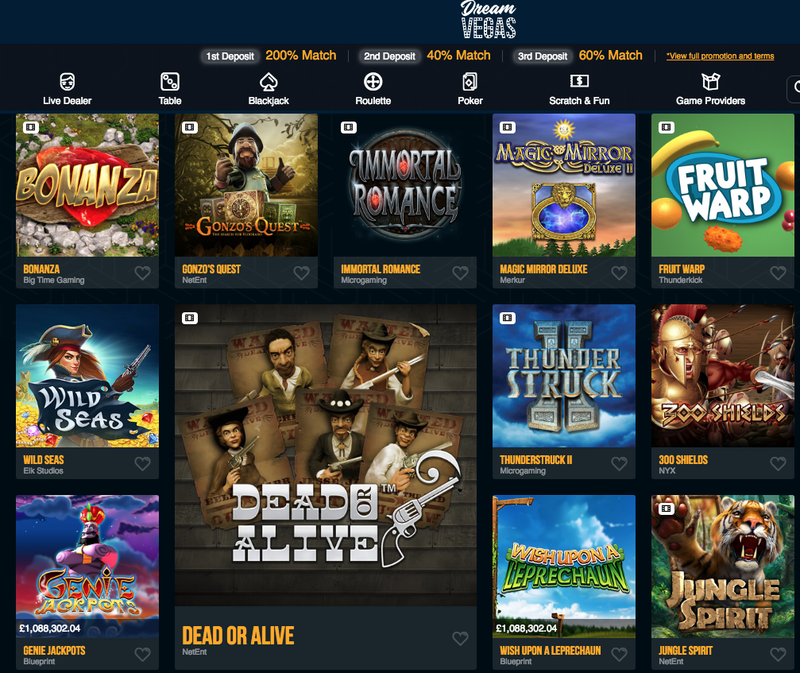 Many of these sites, including Casimba, Miami Dice, Spinland, and Spin Rider have come from the same operator, and a new name has recently joined that family, Dream Vegas. This puts this new online casino site under quite a lot of pressure, because not only does it have to survive, and if possible, thrive in one of the most competitive industries in the world, it also has to prove itself against the network brethren that have come before it. This is the challenge that met all of Dream Vegas’ predecessors and was overcome with style, but at first glance, Dream Vegas looks like it might be the weak link in the family unit. The one continuous upside to casino sites on this network so far has been the unique and original design concepts, and in this regard, Dream Vegas appears to fall at the first hurdle. As the name suggests, Dream Vegas has a Vegas theme, and like every online casino that has come before it with the same theme, and there has been literally hundreds, if not thousands over the years, it just feels derivative and boring. As soon as an image of the Vegas skyline is visible in the background of an online casino site, it immediately sets off alarm bells for anyone who has spent any length of time around the industry, and the predictable imagery does not stop there. Gold flashy logo, awkward models with confused faces in black outfits, almost every mainstay of Vegas themed sites is here, the only difference is that instead of the usual black and gold, the design here is blue and gold, but that’s far from enough to make up for what’s lacking here. Navigation is simple enough, but when you consider what’s come before, that isn’t enough to make up for everything else in terms of design here. After the lacklustre design work, Dream Vegas has a lot to make up for with its games and, to be fair, it accomplishes that with style. A huge mix of games coming from a immense list of software developers that includes names like 1X2 Gaming, 2 By 2 Games, Aristocrat, Blueprint Gaming, Big Time Gaming, ELK Studios, Evolution Gaming, Foxium, Games Warehouse, Inspired Gaming, Just for the Win, Leander, Lightning Box Games, Magic Dreams, Merkur, Microgaming, Multicommerce, NetEnt, NYX, Probability Jones, Quickspin, Rabcat, Sigma Gaming, Seven Deuce, Spieldev, Spike Games, Storm Gaming, and Thunderkick means that Dream Vegas has a collection of games that can put any other newly released online casino to shame. With slots, table and card games, live dealer titles, instant win games, and more, the games selection here will be exciting to players of all levels of experience, but the question is, is it enough to make up for the look of this site? The answer to that is likely to vary from player to player, but if your main priority when it comes to an online casino is having the most possible games available, then Dream Vegas is probably for you.